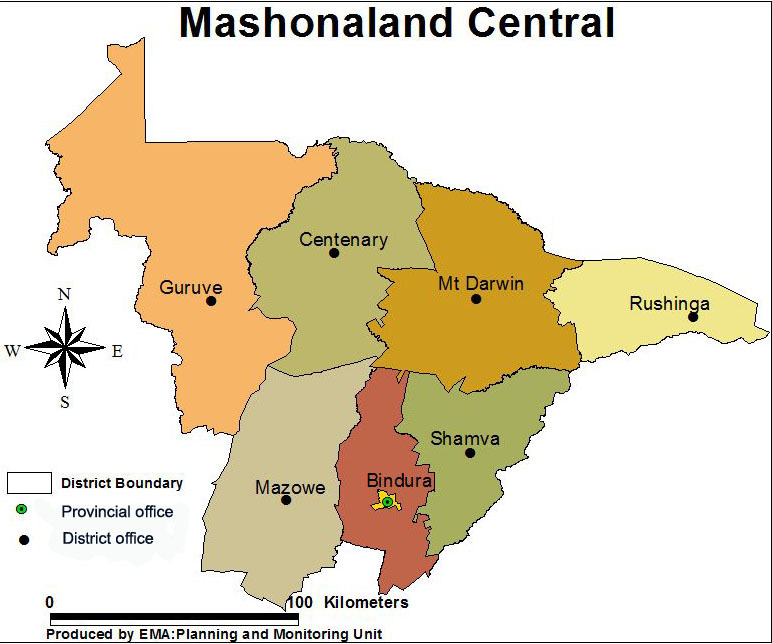 Mashonaland Central Province is located in the North Eastern part of Zimbabwe and comprises of eight districts namely; Mazowe, Bindura, Shamva, Mt Darwin, Rushinga, Muzarabani, Guruve and Mbire. An environmental inventorying exercise was carried out for the Province by the Environmental Management Agency in 2011. The exercise was important as it enabled the Agency to know the exact state of the Province in terms of environmental issues. The analysis of the data gives an overview of environmental threats in the province and should be useful in the development of best practices for the protection of the environment. Major environmental issues which were identified in this inventorying exercise include gullies, wetlands degradation, illegal panning (gold) and the existence and spread of invasive alien species. Areas with bare and unprotected soils resulting in sheet erosion were noted to be the worst affected by gullies, that is including lower Mt Darwin and parts of Mbire. Other human induced factors noted as contributing to gully erosion and are area specific were illegal gold panning activities (in Guruve), brick moulding and overspills from constructed dams particularly in Rushinga and Mt Darwin districts. One hundred and fifty seven ( 157) wetlands were mapped during the exercise and out of these only 20 wetlands are in a pristine state which translates to 13%. Data collected also showed that wetlands were concentrated in Guruve. Streambank cultivation (SBC) is also another environmental issue which was identified and it showed that it is worst in Nyangande river in Mt Darwin district occurring along a 215km stretch of the river. It was noted that SBC was at its peak in the dry season in the Province since soil moisture content is at its lowest. The major drivers for SBC were attributed to improvement of livelihoods through human consumption of products and income generation. Illegal mineral panning was noted to be rife in Bindura district where a total of 35 mineral panning sites were identified followed by Mazowe district. Most of the panning activities (71%) were observed to be occurring in the newly resettlement A2 and A1 farms. To respond to some of these environmental issues, supporting organizations and stakeholders have introduced environmental protection projects which are implemented not only to address land degradation but also improve community livelihoods. A total of seventy- five (75) environmental protection projects were mapped and these include consolidated gardens, gully rehabilitation, woodlots, bee keeping, grazing schemes and the EMA initiatives on fire management. Most of the projects were identified in Rushinga district with 23 projects.